I first had cioppino at San Francisco's Tadich Grill (on whose recipe mine is based). It was a huge bowl filled with fish and shellfish. 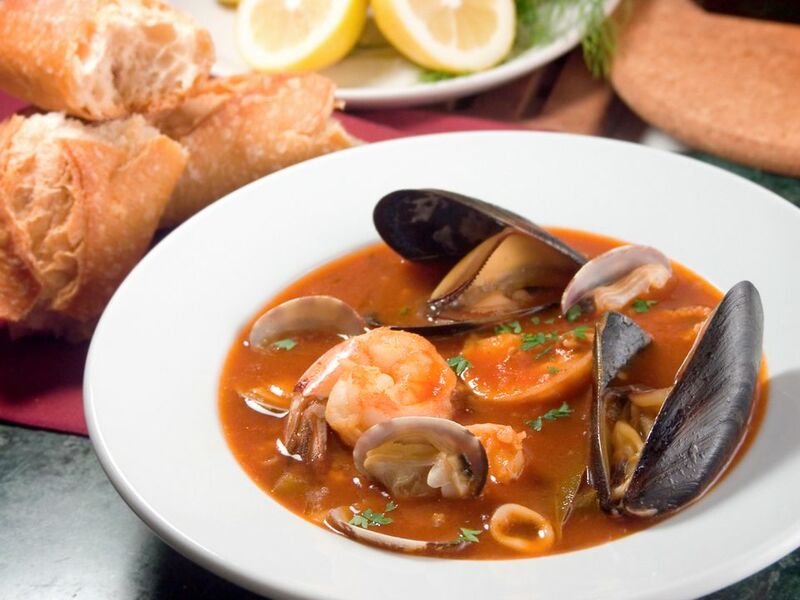 A San Francisco Italian specialty, cioppino was originally a humble soup made with fish scraps, but it's turned into a more spectacular dish, with shrimp, mussels, clams and Dungeness crab in addition to white fish. If you feel like splurging, use a little of each, with scallops as a final touch. The soup is great with any combination you like. While the soup base does take some time to make, much of that is just simmering. It can be made ahead and refrigerated or frozen—just wait to add the fish. In a heavy medium-sized soup pot or saucepan, heat the olive oil and butter. When the butter stops foaming, add the onion, carrot, celery, and fennel. Sprinkle with salt. Stir and cook for 5 or 6 minutes, until vegetables have begun to soften and brown a little. Add the garlic and stir it in, cooking for another minute or so. Add the tomato paste and stir, using the back of the spoon to break the paste apart and coat the vegetables as much as possible. Cook for a few minutes, until the tomato paste begins to darken slightly. Add the wine and stir, scraping up any browned bits from the bottom of the pot. Bring to a boil and cook until most of the wine has evaporated. About 15 minutes before serving, bring the soup back to a simmer (if necessary). Cut the fish into chunks about 2 inches by 1 inch. Scrub the mussels and clams. Turn the heat up to medium-high. Add the mussels and clams and cover the pot. Cook for about 5 minutes, or until the shells open. If using the optional scallops, sprinkle with salt. Just before adding the clams and mussels to the pot, heat a small skillet over medium-high heat. Pour in enough oil to form a thick coat of oil on the bottom. Just when oil begins to smoke, turn down the heat slightly and add the scallops. As the mussels and clams steam, cook the scallops for 2-3 minutes, until deep golden brown. Turn them over and cook the other side for a couple of minutes. Remove to a small plate. When the soup is ready, ladle into shallow soup bowls and place a scallop in the center of each bowl. Turn the heat back down on the soup pot to a simmer and add the fish. Cook for 1 minute, and then add the shrimp and crab. Cook for 2 minutes or just until shrimp are done, and crab is warmed through. When the soup is ready, place a scallop in the center of each large soup bowl (if using scallops). Ladle the soup into the large soup bowls. Sprinkle with parsley or fennel fronds. Serve the cioppino hot and enjoy!